The Sentencing Amendment (Community Correction Reform) Act 2011 substantially takes effect in Victoria today. Combined Custody and Treatment Orders, Intensive Correction Orders and Community Based Orders are no longer available as sentencing options in any court. They are replaced by a single flexible order called a Community Correction Order. Unlike the old ICO, a CCO order is not a term of imprisonment. Orders made prior to 12 January 2012 will remain active until completed or discharged. A CCO may be imposed for any offence punishable by more than 5 penalty units, but only if the offender consents: s 37. A court must order a pre-sentence report if considering ordering a CCO: s 8A(2), except when making an order for unpaid community work up to 300 hours with no other conditions attached: s 8A(3). (The maximum number of hours that can be awarded is 600 hours: s 48C). A CCO must commence within 3 months of the passing of sentence. A court may order the production of a pre-sentence drug and alcohol report if the the court is satisfied that the offender had a drug or alcohol dependency that contributed to the offender's criminal behaviour. The maximum period that a CCO awarded in the Magistrates' Court may run for is 2 years: s 38. For other courts it will be the maximum period of imprisonment allowed. (f) the offender must comply with any direction given by the Secretary that is necessary for the Secretary to give to ensure that the offender complies with the order. and judicial monitoring (s 48K). If a CCO of more than six months duration is ordered, the court may impose an intensive compliance period. During this period additional conditions attached to that order can be imposed. These expire at the end of the intensive compliance period, while the remainder of the CCO continues. Contravention of an adjourned undertaking, suspended sentence or community correction order court will now be an offence, punishable by fine. 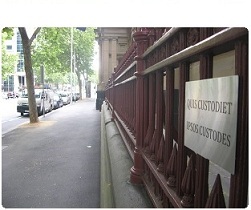 It's not clear but I suspect parliament's intent in creating additional penalties for contravention without interference to the original order is to encourage Corrections Victoria to bring proceedings against people who are not complying with their orders. The trend in recent years has been to repeal breaches proceedings as discrete offences, and instead make them punishable by a court on application. Proceedings for contravention are dealt with under Divison 2, ss 83AG to 83AT. In the case of suspended sentences, courts will now have the option of imposing a separate penalty for contravention, rather than just deciding whether or not to restore the original sentence. (c) in any other case where the person is not the holder of a driver licence or learner permit, disqualify the person from obtaining a driver obtaining a driver licence or learner permit for the period of time that the court specifies. Sub-section (2) of s 89 clarifies that this does not apply to offences under the Road Safety Act 1986. (It does not need to, since these are already dealt with under that Act's s 28(1)). The old authorities and arguments about the meaning of in connection with the driving of a motor vehicle won't be relevant for much longer. If no period is specified, a disqualification is for three months. A court may nominate a day other than the day of sentence for the disqualification to start: s 89AD. The process at the end of the disqualification period for applying for a licence under s 89AF is similar to the system that already exists under the Road Safety Act.